I returned from my Western States adventure with mixed emotions. Oh, don’t get me wrong now, I had myself a great ‘Ol time. 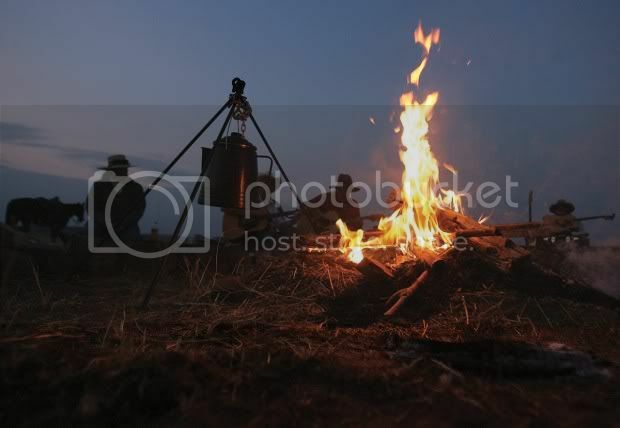 I went discovering, (read my blog at www.campfireshadows.com) gold prospecting, wandered around the desert and mountains… I just had a ball! What I meant to say though, was after unpacking my vehicle, putting all my wash together, repacking all my outdoor gear etc, I stepped into the kitchen and stood there just looking. The one room I love to make a mess in was spotless, like no one lived here. It looked down right lonesome! My pots hung without movin’, my stove had no drips on it, my sink was empty… dang it if I didn’t feel bad starin’ at it. Well, bein’ a fella that doesn’t sit around mopin’, I opened the fridge to see what I had readily available for that evenings dinner. I wasn’t about to go out and fast food it, I did that travelin’ all the way back home! Inside the freezer I still had some containers of chilli I could thaw out, all I needed was some of my cornbread mix to go with it. I usually make a giant tub of corn bread dry ingredient mix and keep it in the freezer. When I want corn bread, I scoop out 3 cups of the dry mix and add a single batch amount of wet ingredients to it. By 6pm I had a quart of thawed and heated chilli and my cornbread skillet ready to pop into the oven. 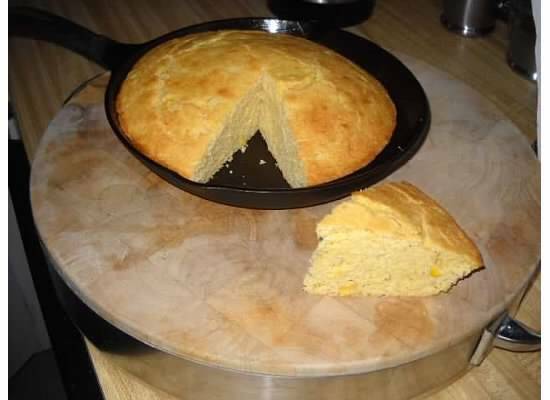 I use a cast iron skillet to bake my corn bread in. The thickness of the cast iron makes sure the baking is even and the sides brown the cornbread perfectly to a golden brown. As I was maulin’ my meal, I wondered how many folks even eat cornbread anymore. I know the ones I know up in West Virginia eat it with nearly every meal. Someday I’ll post their Cornbread casserole recipe! But like most people, they follow the directions on the package and end up with a dry ‘Ol crumbly cornbread that when eaten, imitates you draggin’ yourself through the Sonora Arizona desert at high noon with no water! Dry! Well my cornbread ain’t that way at all! Soft (almost cake like), sweet, pieces of real corn within it, and best of all…Moist! Try this recipe out just once. If you don’t like it… well, if you don’t like it then your taste buds must be damaged to all get out from all that dry crusty stuff you tried draggin’ over your tongue with previous corn bread recipes! 1- Using a spatula, mix dry ingredients together well in a large mixing bowl. 2- In a separate smaller bowl whisk together eggs and milk. 3- Stir in melted butter and creamed corn into the milk and egg mixture. Do not whisk. 5- Pour into a 9” cast iron skillet or round 9” cake pan. 6- Bake for 20 to 25 minutes, or until golden brown and the cornbread springs back when lightly when pressed with the spatula.